Serres, Seres, Amfipolis, Amphipolis, Sidirokastro, Macedonia, Makedonia, Greece Accommodation. A complete guide to accommodation in Greece. 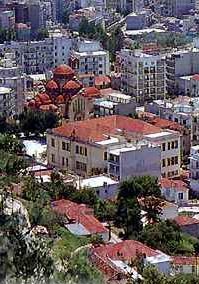 Serres, the capital, is a modern, bustling city, with broad streets and open squares. The new town blends pleasantly with the old. In its northern sector, on the piney hill of Koula, the ruins of the ancient acropolis and the Byzantine castle bear witness to a history stretching from the depths of time. There is also a 14th century church here, dedicated to St. Nicholas with beautiful mosaics. At a distance of 12 kilometres, in a gorge stands the monastery of Timios Prodromos (1270 A.D.) with frescoes of various eras. More antiquities are to be found at Amfipolis, 62 kilometres from Seres, once an Athenian colony, founded in 437 B.C.. Outside the village, near the bridge over the Strimon river, the famous Lion of Amfipolis was discovered, a 4th century B.C. funerary sculpture. The pieces were reassembled and now the Lion guards the bridge. Sidirokastro, near the Bulgarian border, is a pretty town built on the banks of the Kroussovitis river. It took its name (Iron Castle) from the stronghold on the imposing rock, 155 m. above it, that once offered sure protection. The town and the surrounding area are almost overwhelmed by greenery and richly endowed with streams, waterfalls, bridges, churches and monasteries. Holidays in Greece, Greek Accommodation Travel Guide.